a copy on their community bookshelf." I wouldn’t find much new in this book. I was flat wrong." If you make the right choices and set the right expectations for your community at the very start, you will increase your chances of success. 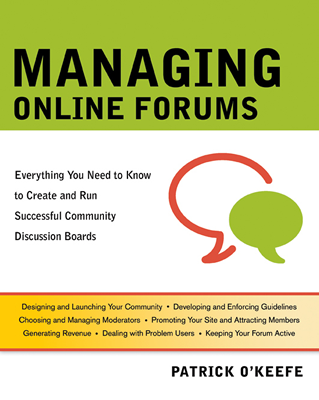 From writing guidelines to contacting your members about inappropriate content, you can build a process of moderation that works for your forums. A community is nothing without great members. Attract the right people and create value for them, so they’ll come back again and again. Your moderators can play a vital role in the health of your community, while becoming your most trusted allies. As your community grows, you’ll face many challenges, including people who want to hurt your forums. Written by a veteran community manager, this book draws on real experiences gained from managing actual communities.